I do like couscous but it can be quite boring if you just add water and stand back. I quite often add lemon juice and/or some chopped herbs just to spice it up a bit and make it a bit more interesting. This time though I decided to kick it up properly, and it made it much more interesting. You can use your favorite store bought salsa (I used Hot Bonesuckin' Salsa from bonesuckin.com - you can get it at Waitrose here in the UK) or make your own. It all depends on how much time you got and how much of an effort you want to make. The marinade I used is one I use quite often for both chicken and pork. Try it with pork tenderloin, it really works well. The thing I can say, give it proper time to marinade - over night is ideal. Enough waffling, over to the recipe. Put the chicken breasts in a ovensafe dish and pour the marinade over it. Cook in the oven for 20 - 30 minutes or until cooked. In the meantime, prepare the kicked-up couscous. Mix the salsa, mango chutney, orange juice and coriander well in a bowl. Once mixed, fluff up the cooked couscous using a fork and then mix in the salsa mixture. 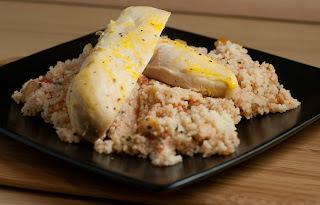 Once the chicken is cooked plate up the couscous and put the chicken on top. Jag hittade hit via Millan och Chrisses Salt&Peppar sida. Är liksom du, en svensk i exil i England. Jag har fortfarande lite svårt med en del av den engelska matkulturen men jag vänjer mig! Skojigt att hitta någon i "samma sits" så att säga! har du några bra tips på vart man kan hitta svenska ingredienser här, bortsett från Ikea? Det tar tid att vanja sig. Hur lange har du varit har? Det kan vara bra att ha nagon att 'falla tillbaka pa' nu och da. Jag har inte hittat nagot bra stalle. I bland har jag handlat fran www.northerner.com. Det har varit bra och snabba leveranser. Godis hittar jag pa Cybercandy i Covent Garden. http://www.cybercandy.co.uk.